Nikki is very much in demand and is one of the busiest Birthday party magicians on the circuit. Her shows are tailored to make the Birthday child's day one to be remembered and to make them an absolute star. Nikki also has many repeat bookings and is a regular at schools and preschools right across the South. Her natural affinity with young children, her warm and gentle nature along with her great sense of humour make her very popular with both boys and girls of all ages and parents and teachers alike. Nikki has been in the entertainment business her whole life and that's something that very few children's entertainers can say. She has never worked in any other occupation since she started in galas and shows at the age of just 3 years old and performed in pantomimes alongside many famous names from the tender age of 10 years onwards. After leaving school Nikki's dream became a reality. Performing for audiences wherever she could to gain experience proved to be an invaluable lesson. Since then she has toured the world performing her magic act, appearing on Television, travelling as far a field as Australia, the South Pacific, Africa, Japan, China, Russia, and all over Europe, in theatres, top hotels and on many luxury Cruise ships. You Found Letter "M"Find the other four letters to complete the treasure hunt. After travelling the globe Nikki decided to come back to the UK where she now lives with her husband Charlie and their two daughters. 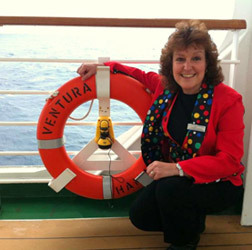 Nikki now mainly performs her shows across the South of England, although she still performs occasionally on cruise ships travelling to many exotic places for a week or two from time to time. 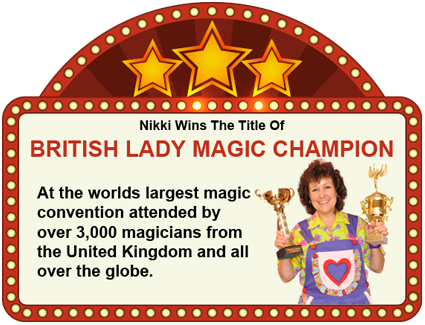 The top of her field..
One of the many highlights of Nikki's career was when she was invited to take part in the highly acclaimed British magical Championships, where she took the top honour and won the title of British Ladies Magical Champion. Nikki also had the honour of being invited back a for a second time to appear in the prestigious 'All winners show' where she performed and was awarded a second trophy and received a diploma of proficiency in the art of magic. As if that wasn't accolade enough Nikki was then asked to become one of the first ever Lady Members of what has been described as 'the most exclusive club in the World' the famous London magic Circle. An honour never bestowed on a female magician before that date. Since then just recently Nikki was given the honour of becoming an associate of the inner Magic Circle with Silver star. Hi Nikki thank you so much for an amazing party for Izzy and her friend yesterday. They all had such a great time and there were many nice comments coming from the parents. Even the hotel manager commented on you kept control throughout the whole two hours and made his job so much easier. Thanks again. Clare. Children's entertainer, Nikki The Magic Lady, kids birthday party entertainer, family & corporate shows, covering Portsmouth, Southampton, Hampshire, West, Sussex, Surrey, Berkshire, Wiltshire, Dorset and beyond.